Thank you for your contributions last weekend. The total given towards the fund in September totalled £758.34. Envelopes are available at the back of both churches. The Holy Year of Mercy concludes on the Solemnity of Christ the King. On 25th September we began a 9-week Novena ‘for Forgiveness’ in the form of a Holy Hour with readings, prayers and litanies. Please come along to Christ the King at 5.00 pm to join this Novena for Forgiveness. This Friday at 7.30 pm in the Parish Centre at St. Margaret Mary, we have an inaugural gathering of the Parish Youth Group. This group is for secondary school aged young people. Friday night will be a Pizza night and will be an opportunity for the young people of the parish to shape the nature of the group. The session will end at 9.00 pm. This will be held on Saturday 8th October 2016 at Lancaster Cathedral. The bus will be picking up at certain places and the cost of the day out is only £10. There is a list at the back of both Churches to add your name to should you wish to go on this pilgrimage. It is an opportunity to gain the Jubilee Indulgence during this Holy Year of Mercy. 67 + 75 + 84 = 226 were at Mass last weekend. Thank you for your offering of £481.53 + £267.69 = £748.99. Please keep in your prayers the students of our diocese who are preparing for service in the ministerial priesthood: Daniel Etienne, Steve Talbutt, Stuart Chapple & Philip Wrigley. I am currently considering celebrating an early morning Mass each day at Christ the King [at 8.00 am] rather than chopping and changing each week so that there is a regular rhythm to the liturgical life in the parish. It would meet a need in Carlisle for a regular early morning Mass and would also facilitate a spiritual need within my own priesthood to begin each morning with the celebration of Holy Mass. At St. Margaret Mary’s there would still be a 9.15 am school Mass on a Wednesday and an evening Mass for ‘workers’ on Tuesdays [additional] and on Fridays. 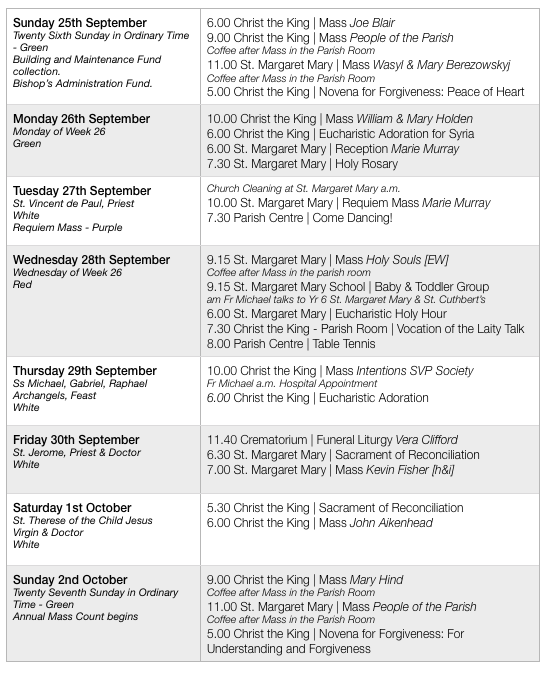 My rest day on Monday and Education Service Work on Thursdays [with meetings beyond 6.00 pm prevent an evening Mass on these days. I’d still welcome any views on this. The Ladies Group will be meeting next Tuesday (4th October) at 7.30 pm in the Parish Room. Our speaker will be talking to us about living and working with deafness. There will be a meeting on Monday evening of this group of parishioners. The parish will host Newman Catholic School on Monday 10th October as they celebrate Holy Mass for their patronal feast at 10.00 am at Christ the King. Fr. John Millar will preside at this celebration of Holy Mass. Responding to Pope Francis’ passionate calls for the Church to evangelise, St Bede’s/St Edmund’s are offering a catechesis for youth, adults, Catholic, non-Catholic, atheists etc. These catecheses, presented by the Neo-catechumenal Way, will take place Mondays & Thursdays, beginning 3 October, at 8.00 pm in St Bede’s Liturgy Room [in the Church]. If you want to grow in faith or find out how to share your faith with others around you, come along and bring family and friends. The Bishop invites all who are involved in teaching (in the Catholic or State sector), Liturgy with Children, preparation for First Holy Communion, etc, to gather with him for Mass in our diocesan cathedral, Lancaster LA1 3BT, on Friday 14 October at 7.00 pm, to ask God’s blessing on the new year of teaching and formation. This Friday. Envelopes next weekend. Envelopes can be handed in this weekend during the main collection. If you Gift Aid, please include your envelope number. If you normally contribute via Standing Order, please add your surname to the envelope. The Holy Year of Mercy concludes in 9 weeks’ time on the Solemnity of Christ the King. 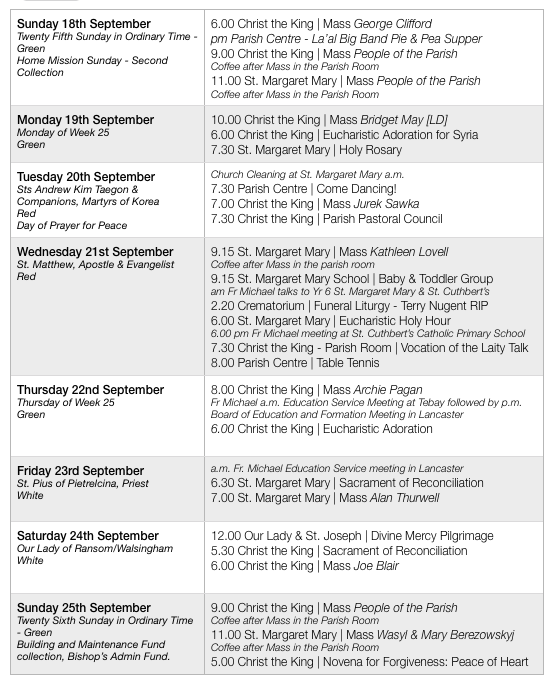 Beginning this Sunday [25th September] we will celebrate a 9-week Novena ‘for Forgiveness’ in the form of a Holy Hour with readings, prayers and litanies. It would be a good way to mark the end of the Holy Year of Mercy and seek the grace to forgive. 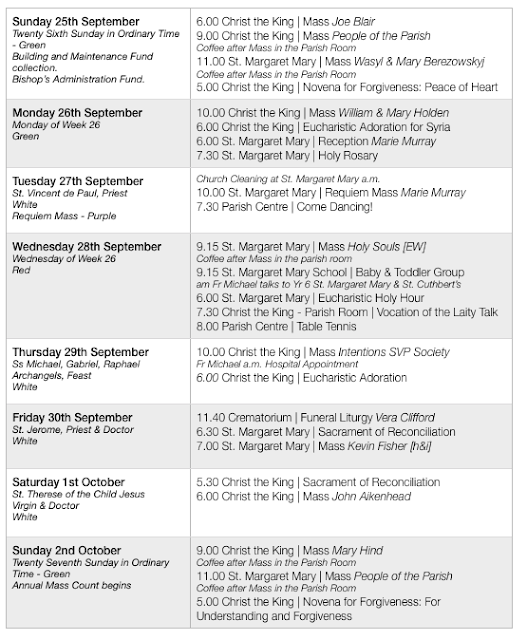 Autumn Formation in the Faith - this week! Formation in the faith is an important part of being a follower of Jesus Christ. Fr Michael will offer a series of talks and discussions on the vocation of the laity which will be held in the parish room at Christ the King beginning at 7.30 pm. Come along. All are welcome. This will be held on Saturday 8th October 2016 at Lancaster Cathedral. The bus will be picking up at certain places and the cost of the day out is only £10. There is a list at the back of both Churches, to which you can add your name should you wish to go on this pilgrimage. It is an opportunity to gain the Jubilee Indulgence during this Holy Year of Mercy. 64 + 71 + 105 = 240 were at Mass last weekend. Thank you for your offering of £449.15 + £264.91 = £714.06. The SVP is always in need of new members to carry out this work so if you would like to find out more, please contact Kate Reardon at St. Margaret Mary or Paul Daley at Christ the King. Please keep in your prayers the students of our diocese who are preparing for service in the ministerial priesthood: Daniel Etienne; Steve Talbutt; Stuart Chapple & Philip Wrigley. 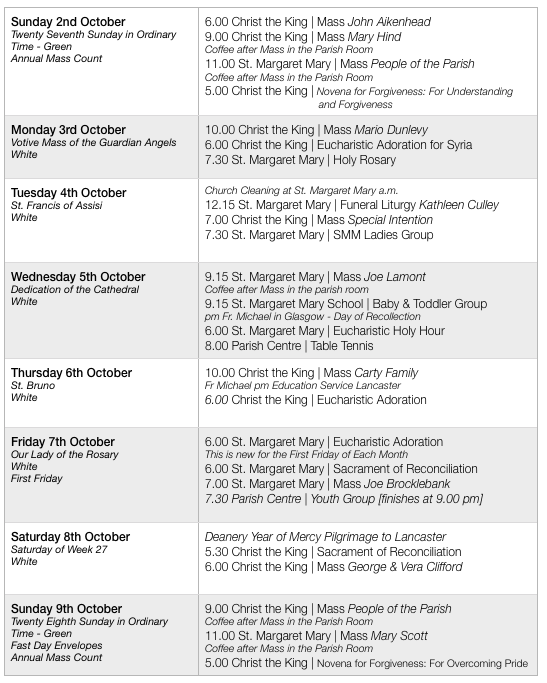 There is a Mass for the close of the Diocesan Year of praying for Priestly vocations at Lancaster Cathedral on Tuesday 27th September at 12.15 pm. All are welcome to attend this celebration of Holy Mass with Bishop Campbell. I apologise for the erratic timings of Mass during the week at the moment due to commitments within the Diocesan Education Service. I am currently considering celebrating an early morning Mass each day at Christ the King [at 8.00 am] rather than chopping and changing each week so that there is a regular rhythm to the liturgical life in the parish. It would also meet a need in Carlisle for a regular early morning Mass and would facilitate a spiritual need within my own priesthood to begin each morning with the celebration of Holy Mass. At St. Margaret Mary’s there would still be a 9.15 am school Mass on a Wednesday and an evening Mass for ‘workers’ on Tuesdays [additional] and on Fridays. My rest day on Monday and Education Service Work on Thursdays (with meetings beyond 6.00 pm) prevent an evening Mass on these days. I’d welcome any views on this. On Monday 12th September, Life launched a Care Centre in Carlisle. This will be open for anyone to drop by to discover the range of support available to any family or individual facing an unexpected or crisis pregnancy. There is more help available than many people think. We will be at Waterton Hall, Warwick Square, Carlisle, every second Monday of the month from 12:00 - 2:00 pm. Professionals such as Doctors, Nurses, Midwives, Carers and Teachers could also benefit from the extensive support network available and will be made most welcome. More information is available by contacting Life locally on 07501 0684876 or email at north.cumbria@lifecharity.org.uk. Please pray for the success of this initiative. For those who missed the distribution of envelopes last weekend, packs for the Building and Maintenance Fund are available. The packs contain an explanation of the fund. Formation in the faith is an important part of being a follower of Jesus Christ. Fr Michael will offer a series of talks and discussions on the vocation of the laity. They will be held in the parish room at Christ the King beginning at 7.30 pm. Come along. All are welcome. This will be held on Saturday 8th October 2016 at Lancaster Cathedral. The bus will be picking up at certain places and the cost of the day out is only £10. There is a list at the back of both Churches, to add your name to should you wish to go on this pilgrimage. It is an opportunity to gain the Jubilee Indulgence during this Holy Year of Mercy. 68 + 72 + 102 = 242 were at Mass last weekend. Thank you for your offering of £426.80 + £227.70 = £654.50. The Holy Year of Mercy concludes in 9 weeks’ time on the Solemnity of Christ the King. Beginning next Sunday [25th September], we will celebrate a 9-week Novena ‘for Forgiveness’ in the form of a Holy Hour with readings, prayers and litanies. It would be a good way to mark the end of the Holy Year of Mercy and seek the grace to forgive. Will meet next on Tuesday 20th September in the Parish Room at Christ the King following Mass. Pope Francis invites us all to make a Day of Prayer for Peace in our world on Tuesday 20 September 2016, the day of the Inter-religious gathering in Assisi presided over by Pope Francis. I apologise for the erratic timings of Mass during the week at the moment, which is due to commitments within the Diocesan Education Service. I am currently considering celebrating an early morning Mass each day at Christ the King [at 8.00 am] rather than chopping and changing each week, so that there is a regular rhythm to the liturgical life in the parish. It would also meet a need in Carlisle for a regular early morning Mass. It would also facilitate a spiritual need within my own priesthood to begin each morning with the celebration of Holy Mass. At St. Margaret Mary’s there would still be a 9.15 am school Mass on a Wednesday and an evening Mass for ‘workers’ on Tuesdays [additional] and on Fridays. 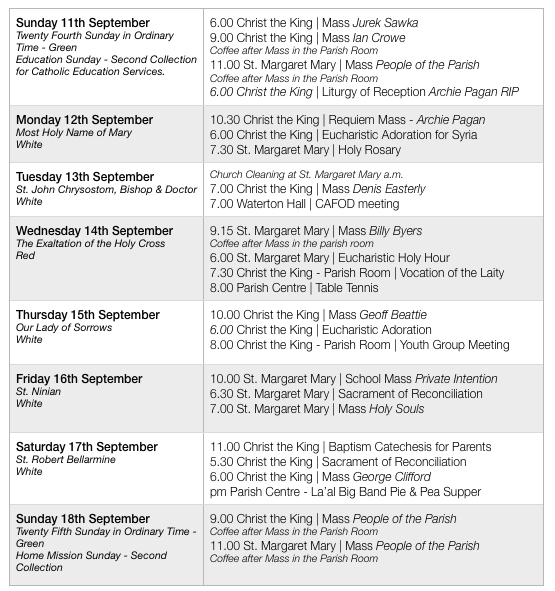 My rest day on Monday and Education Service Work on Thursdays [with meetings beyond 6.00 pm prevent an evening Mass on these days. I’d welcome any views on this. On Monday 12th September, Life launched a Care Centre in Carlisle. This will be open for anyone to drop by to discover the range of support available to any family or individual facing an unexpected or crisis pregnancy. There is more help available than many people think. It will be at Waterton Hall, Warwick Square, Carlisle, every second Monday of the month from 12:00 - 2:00 pm. Professionals such as Doctors, Nurses, Midwives, Carers and Teachers could also benefit from the extensive support network available and will be made most welcome. More information is available by contacting Life locally on 07501 0684876 or email at north.cumbria@lifecharity.org.uk. Please pray for the success of this initiative. This weekend Fr. Michael will speak at all Masses about the launch of a ‘Building and Maintenance Fund’ in the parish. The diocese requires that parishes raise 50% of any building and maintenance costs from ‘new’ money for any work planned. This fund will help contribute to this. Formation in the faith is an important part of being a follower of Jesus Christ: beginning on Wednesday 14th September, Fr Michael will offer a series of talks and discussions on the vocation of the laity entitled ‘Lumen Gentium’. They will be held in the parish room at Christ the King and will commence at 7.30 pm. Come along. All are welcome. On Saturday morning at 11.00 am in the parish room at Christ the King, an hour long preparation for parents wishing to have their children baptised in the parish. These are held on a monthly basis but parents wishing to have their children baptised in the parish must attend one of these sessions. Many thanks to those who have spoken to Fr. Michael. There will be a meeting of adults interested in helping to discuss progress on Thursday 15th September at 8.00 pm at the Presbytery Christ the King. This will be held on Saturday 8th October 2016 at Lancaster Cathedral. The bus will be picking up at certain places and the cost of the day out will be £10. There is a list at the back of both Churches - add your name to it should you want to go on this pilgrimage. It is an opportunity to gain the Jubilee Indulgence during this Holy Year of Mercy. Please continue to support this worthy initiative via the basket in the porch at Christ the King. We have been asked by Carlisle Food Bank if we can particularly supply UHT Milk, Rice Pudding, Custard, Tinned Fruit and Pasta Sauce. There is a basket in the porch for items at Christ the King. Stocks are short at the moment - tinned meat and other items high in protein would be greatly appreciated. 61 + 75 + 89 = 225 were at Mass last weekend. Thank you for your offering of £410.12 + £241.07 = £663.46. Come and find all that God has prepared for your masculine heart. Inspiring & challenging talks, fellowship, and sharing with other Christian men, walk in the Lake District, and much more! Saturday 17 – Sunday 18 September, Cor et Lumen Christi community, Wigton CA7 9HU. Donation only event. Tel: 016973-45623 or 07516- 075896. A seminar on “Problems in End of Life Care” is being organised in the parish of Our Lady and St. Joseph, Warwick Square CA1 1LB, for Saturday 17th September 2016 at 12.45 pm in Waterton Hall. It will be delivered by Dr Stephen Brennan who is the Secretary of the Catholic Doctors Association UK. It is an opportunity for us to learn something about coping with family members and friends who are on their final journey through life. Fr Laurence Freeman OSB will lead this day of reflection on Saturday 1 October, 10.30 am - 3.30 pm at Stoneybeck Inn Conference Centre, Penrith CA11 8RP. To book, please contact Richard Broughton on 01946 862990 or email: cmccwccm@fastmail.fm. Donations suggested £20 or contributions £10. Please bring your own packed lunch. Drinks will be provided. Inspirational Input, Adoration, Praise & Worship and Prayer Ministry on Wednesday 14 September at Cor et Lumen Christi, Wigton CA7 9HU. Mass at 7.00 pm / Meeting starts at 8.00 pm - All Welcome! Will meet next on Tuesday 20th September in the Parish Centre.